touches of sense...: Lest we forget. Yes, they were still there on my phone. They were the last of the very few I had kept from those taken while clearing out my uncle's house. He refused to be buried, to be trashed. I had only been vaguely aware of his existence when I was younger. He was one of those half-remembered names among those half-remembered lists of family names. He was my grandfather's brother. He was the one brother who didn't get through the war. In the last years of my parents life I was driven to capture every last story. Before they spoke no more. Who are those sepia people staring so blankly at us? Why do they refuse to be forgotten? I left messages on forums, in the hope that someone, somewhere might give me a scrap which might rekindle long forgotten story. A distant relation emerged in Canada, an Irish second cousin, I can never remember how many times removed, responded too. Suddenly, I had my name connected to 14 generations. I had an Excel file with a family tree. I was discovering my plot among the stories. I started to make more sense to myself. I was one among many, so many. A visit to a war cemetery in Flanders on a website brought me face to face with a stone cross bearing my great uncle's name, age, rank and regiment. "His" stone cross, was one among many to scroll. 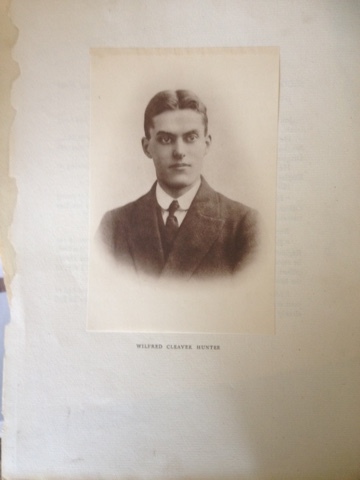 Wilfred C. Hunter. 24. 2nd Lieutenant. 121st Heavy Battery. Royal Garrison Artillery. 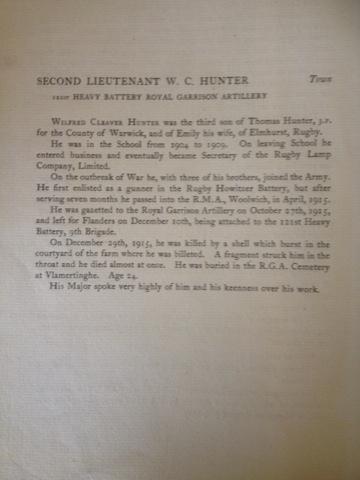 Sorting through my uncle's papers, a few years on, my parents long gone, I came upon his name again. I took a photo of a document before filing it away with others salvaged in the grief. He was there, resolute, on my phone. 2015 seems so much closer now to 1915. 2014, he appears in my writing, for an article for a French teaching journal. In the article I speak of how digital tools enable us to give new life to the past. These stories of loss are alive still. Thank you so much for following this thread and writing/sharing this post. I feel like the distance between you and I is less, much like the distance between 2015 and 1915. Yes. Thank you Michelle. You are right. Wilfred is determined to speak. I wrote a first post, had almost finished it and forgot to save it while searching a link. I waited a moment. I went right back and rewrote a post. I didn't really think before writing, before rewriting, he spoke. Thank you for letting us bring two young lives together in a meaningful way. It's like the horrors of wars connect us over thousands of miles and decades of years through the digital media of the 21d century.